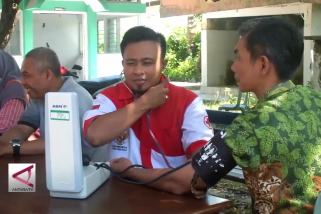 Situbondo, E. Java, Oct 11 (Antara) - A major earthquake with a magnitude of 6.4 on the Richter scale rocked the East Java district of Situbondo sending panic people to rush out of their houses very early in the morning on Thursday. The quake hit at 01.44 western Indonesian time with epicenter 7.42 degree on the south latitude and 114.47 east longitude at a depth of 10 kilometer in the Bali Sea . The epicenter was around 61 kilometers northeast of the city of Situbondo, and 860 km southeast of Jakarta, the Meteorology, Climatology and Geophysics (BMKG) office said. The agency said the quake has no potential to trigger tsunami. However, after the quake, people in the city of Situbondo, chose to sleep outside their houses traumatic of the recent quake and tsunami in Central Sulawesi and Lombok. No report yet of casualty and damage to the property caused by the quake. The tremors were also felt strongly in the East Java capital of Surabaya. "I felt the jolt when I was about to go to bed," Niswati, who lived at Bulak Banteng Wetan area in the city said, adding, though only a few seconds I was traumatic by the disasters in Central Sulawesi and Lombok." Earthquake and tsunami left more than 2,000 people dead in Central Sulawesi only less than two weeks ago and more than 550 killed in Lombok a month earlier.